Welcome to the July 2011 issue of Steinlifters Online, the newsletter for members of the Milwaukee Region, Porsche Club of America. The board of directors and a group of committee chairs and event leaders are continuing to plan activities in which you can meet other members and share the outstanding experience of driving your Porsche. With several great events "in the books" already, this issue has some cool reports and photos. And there's more to come. We hope you will join us for an event in the near future. July 3 - Autocross at Miller Park. Details here. July 7 - Board meeting. Wisconsin Club Country Club, 6200 W. Good Hope Rd., Milwaukee. All members always welcome. 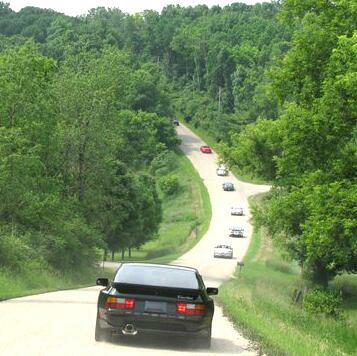 July 16 - Drive to Elkhart Lake to view the spectacular Road & Track Concours. RSVP required by July 9. Details here. July 21 - PCA Night at Festa. Join other region members for a night at Festa Italiana in Milwaukee. Details here. July 25 - DE at Blackhawk. Details here. July 31 - PCA's annual national gathering, Porsche Parade, begins. Details here. Aug. 21 - Autocross at Miller Park. Details here. Aug. 27 - Club Day at the Masterpiece. 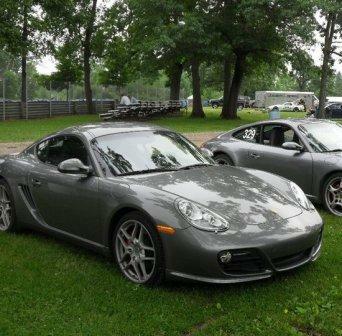 Porsche is the featured marque on Club Day at this year's Masterpiece on Milwaukee's lakefront. Details here. Have you renewed your membership yet? Our membership chair reports that 92 percent of members with renewal dates in July haven't responded yet. PCA only sends out one notice. Please act soon so that your membership does not lapse. We want to continue to count you among our active, PCA friends. Congratulations to these members who are observing a membership anniversary in July. The Cayman S is Dan’s first Porsche. He has already attended the region’s recent driver education events at Road America and Blackhawk and is looking forward to trying our autocross events too. An ophthalmologist (eye surgeon) for Eye Care Specialists, he’s also busy with children aged 3 and 5 so “weekend time is somewhat limited,” Dan noted. Read a recap of some of the events recently enjoyed by region members. Milwaukee Region member Lynn Palmer's recent business trip produced had an unexpected delight when he checked into his hotel. Read the story here. The June 18 Spring Tour. Our region's annual spring tour lived up to its reputation as one of the best events on the annual calendar. Details and photos here. Fox Valley Region Waterfalls tour. Several Milwaukee Region members joined the Fox Valley region for a tour of some of the U.P. 's spectacular waterfalls. Story and photos here. Ladies Only Driving tour. Milwaukee Region member Donna Daufenbach joined women from the Fox Valley for a ladies only driving tour recently. Read Donna's report here. Check out the video in this link, sent by region member Mike Wiviott, for a peek at an incredible collection of U.S. muscle cars and European sports cars. Porsche unveils the GT3 Cup race livery. Details here. Porsche celebrates 15 years of Boxster production. Details here. Top Gear reports on the new 911. Details here. Rennsport Reunion -- This is a cool event, coming up in October. Details here. Classifieds. The classifieds section is one of the most widely read features of our region site. Check out what's for sale here. Region contacts. Need to contact one of the board members or a committee chair? The list is always available on this website by clicking on the Contact Us tab on the left side of every page. The editor welcomes your contributions for this semi-regular feature of the newsletter. Submit pictures you've taken of strange or interesting items related to cars, motoring, Porsches, etc. This month's submission is from Ron Pace, vice president of the board and the region's chief driving instructor. 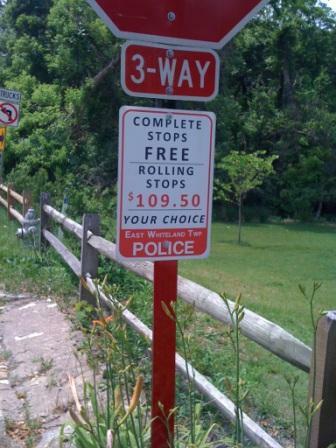 We trust Ron took the safe and inexpensive action.